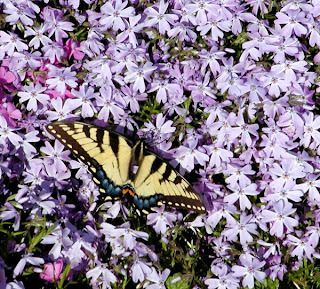 Today was butterfly day at the Inn on Mill Creek. 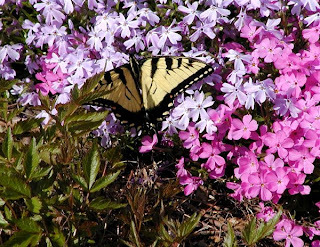 Earlier this week, a guest pointed out to us what we think was the first butterfly to arrive this year, although it might just be that we hadn’t seen earlier arrivals. 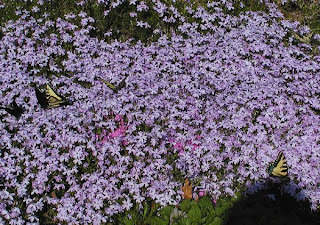 There was a single butterfly hanging around the creeping phlox that day. 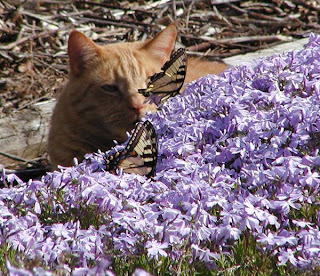 Even Joey the cat was observing the butterflies. We think he was keeping a safe distance due to the fact that there were lots of buzzing bees hanging around the flowers, too. Being ten years old, Joey knows a thing or two about staying away from things with stingers. 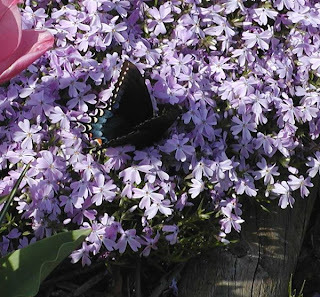 He’s a smart cookie, even when he’s outwitted by butterflies.